The NWA announced today the death of wrestling legend Corsica Joe (Francois Miquet) in Nashville, Tenn. at the age of 90 today. Miquet and his tag partner, Corsica Jean, were inducted into the NWA's Hall of Fame two years ago when the NWA ran a big-arena show at the Phillips Arena in Atlanta. 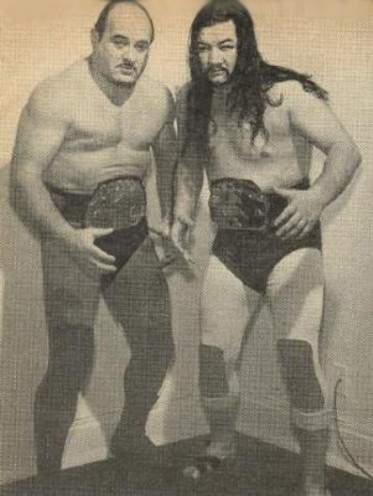 Corsica Joe & Jean held the NWA World Tag Titles five times in the 1950s and they were NWA Soutern tag champs in Georgia during the 1960s. Miquet was on the very first TNA PPV in June 2002, back when the promotion was NWA-TNA. Miquet was part of the parade of NWA legends to create synergy between TNA and the heritage of the NWA. Miquet, as Corsica Joe, was joined by his wife, Sarah Lee, Harley Race, Dory Funk Jr., Jackie Fargo, Bob Armstrong, and Ricky Steamboat. -- READ MORE: Wade Keller's original TNA PPV Report & Analysis. Thanks to Bill Behrens for the information.